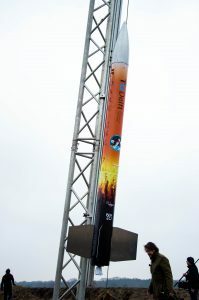 DARE has been the main rocket supplier for the annual Dutch CanSat competition since its conception in 2007 up until it discontinued in 2014. This competition was organized by the TU Delft as an outreach to Dutch secondary schools. Teams of 15-16 year old pupils compete to build the best CanSat. A CanSat is a small satellite built in a soda can, a perfect tool to learn pupils about space technology and gain their interest to pursue a study in technology. Since a few years ago, ESERO is organizing a newly styled CanSat competition, and once more DARE is the main rocket supplier. Since the beginning, DARE has been improving its CanSat Launcher to better suit the growing competition needs. Experience in the logistics and operations of the launch campaigns has resulted in very successful launches of more than 30 CanSats up till now. Learning from past experiences DARE has grown to be a professional and reliable partner in the organization of this competition. 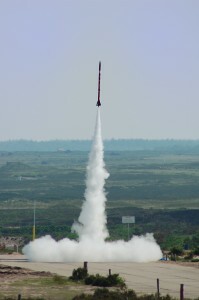 The low apogee of the CanSat rockets provides the unique opportunity to test and fly the vehicles in the Netherlands. This is done at ASK ‘t Harde in Gelderland where we organize launch days multiple times each year. The CanSat V7 can carry several CanSats at once to an altitude of about one kilometer. At its apogee, the rocket releases its two side hatches and deploys the CanSats. While the CanSats perform their mission, the launcher also deploys a parachute, gliding gently down to Earth. After landing, the launcher is recovered, refurbished in Delft and prepared for a new mission. The reusability of the launcher, combined with the relatively short turnaround time and effective production methods, make the vehicle very cost-effective. The CanSat V7 limits the use of pyrotechnics devices; all ejection and release mechanisms are mechanically operated. This makes the vehicle very safe in operations and even allows pupils to insert their own CanSat in the rocket, enhancing the launch experience even more. After loading the CanSats in the rocket, no one is allowed close to the rocket anymore, as the DARE Safety Board inserts the solid motor in the launcher, transports it to the launch tower and prepares the vehicle for lift-off. The CanSat V7 is propelled by the DX-1 solid rocket motor. This motor is capable of delivering a total impulse of 2.7 kNs and has a burn time of roughly 3.5 seconds. The propellant consists of a blend of potassium nitrate and sorbitol and burns at a relativity low temperature. This allows the use of a stainless steel motor casing and nozzle which, after thorough cleaning inspection, can be reloaded and reflown on a new mission. The DX-1 is the oldest engine in DARE and has a very large flight heritage. Between 2005 and 2006 DARE started the development of its own CanSat Launcher. This resulted in three prototypes: CSL v1, CSL v2 & CSL v3. After the successful launch of the third prototype development started on the first production model, the CSL v4, for the pilot CanSat Competition held in 2007. A year later the competition went national and needed an improved model, the CSL v5. This rocket incorporated all the experience and lessons learned during the previous versions. As a result, the rocket was very reliable and easy to use. After the CanSat competition discontinued temporarily, DARE has still been working with the improved CanSat V7. The seventh generation is very reliable, safe and cost-effective to manufacture. Moreover, the vehicle is designed in a modular fashion, which allows research and development teams in DARE to test their new systems in flight without having to develop a completely new vehicle. Good examples are the ACT CanSat, which features four canards to actively stabilize the vehicle. 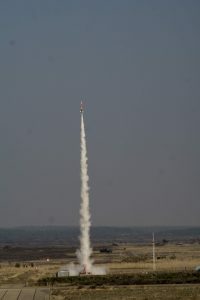 Tests with the CanSat rocket were carried out as a demonstrator for the larger Aether vehicle, which features supersonic canards. Our Parachute Research Group has also flown several CanSats and tested new parachute deployment systems on the vehicle, such as gas-powered ejection. CanSat V4 leaving the tower. CanSat V7 in launch tower.